This morning while working out at my local gym, the owner, Paul Hunter appeared in PINK. 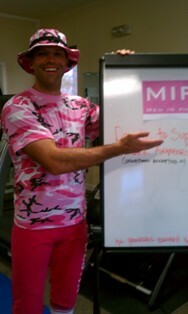 He runs a Men in Pink fundraiser every October during Women’s Breast Cancer Awareness. This year so far and the month is not over yet, he has raised $2,200. Paul himself is a cancer survivor and quite a nice guy. He always has a smile on his face and is very optomistic. Take a look at this photo of Paul. He also dresses in PINK during the month of October and the more money that is raised, the more outrageous his clothing becomes. While visitng in the area, you can buy a day pass or a week or month pass to work out. Also, if you would like to look at some properties while in town, please give me a ring on my “Shell Phone” at 850-420-2480. This entry was posted in Real Estate News, Uncategorized and tagged Breast, Cancer, Cancer survivor, Conditions and Diseases, Health, Paul Hunter, real estate, United States House of Representatives. Bookmark the permalink.